“It’s going great,” Josue “The Prodigy” Vargas (12-1) says of training camp in the leadup to his Saint Patrick’s Day clash with Adriano Ramirez (10-2) at Madison Square Garden’s Hulu Theater. 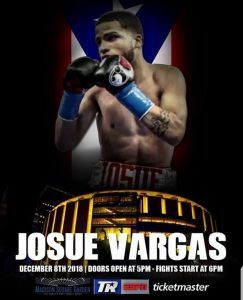 Vargas, a rising super lightweight, has now found himself sharing a card with the likes of Luis Collazo, and Michael Conlon. “I have a lot of fans in New York,” he says, “mainly in the Bronx.” Needless to say, the New Yorker expects to have his supporters on hand come the 17th. “A lot of people bought tickets,” he adds. Vargas, who has eight KO’s on his record, has stopped all of his last four opponents within the distance. “I’m getting older,” he says, “so my power’s getting there.” Vargas says he’s now shooting for knockouts in the fourth or fifth rounds. “I’m just going to keep knocking these guys out,” he claims. Vargas can take inspiration from Mikey Garcia, who he’s helped train for Garcia’s upcoming superbout with welterweight star Errol Spence Jr. “It was great,actually,” says Vargas of the experience. “I sparred fifteen rounds with him. It was amazing.” Although he trains with the famed Robert Garcia, Vargas is also trained by his own father, which makes boxing a family affair for the Vargas’, just like it does for the Garcia family (Robert, a former champion himself, is Mikey’s brother). Being part of Top Rank Promotions’ stable of fighters has certainly proved beneficial for the New Yorker, as well. “Everything’s going great,” Vargas says in reference to his relationship with his promoter. With an amateur pedigree that saw him face the likes of Shakur Stevenson, Vargas is being led through the pro ranks in a manner that allows him to steadily rise while appearing on attention getting cards. “I’m getting closer to the world title,” he says. All Vargas has to do is keep winning. Ramirez, who Vargas will be facing on the 17th, is a fighter Vargas has made sure to familiarize himself with. A short, affable seeming individual who fights in a crouched style and likes to hook his shots, Dominican Republic native Ramirez is undoubtedly looking to come back strong after suffering a loss to Matt Conway last December. Vargas, however, is not only stepping into the ring with strong backing and a strong pedigree. He’s also stepping in with the knowledge that an impressive win can help him climb up the ranks at a rapid pace. After all, the man makes it clear he’s getting closer to a world title. The March 17th Hulu Center card will be aired live on the ESPN+ streaming service. “I had a great amateur background,” super lightweight Josue Vargas tells me. “I’m ready for anything right now.” Having recently signed with the prestigious Top Rank Promotions, Vargas is especially ready for John Renteria, his opponent this Saturday night at the famed Madison Square Garden in New York City. 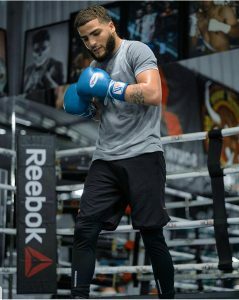 For Vargas will be part of a card that will see pound for pound powerhouse Vasyl Lomachenko pitted in the main event against Jose Pedraza. With an amateur career that saw Vargas face off against the likes of Shakur Stevenson, the Bronx native feels like he has the pedigree to rise to the top of the sport himself.